Discussion in 'Electric Instruments' started by DHW, Jan 6, 2015. Another question on my se 245. As I go through all this electronics stuff I keep thinking about how sticky the neck can get when my hands are warm. I don't want to drastically drastically change the look of the guitar and I definitely don't want it to come out looking like someone took sand paper to it with no clue what they are doing. What is the best way to take it down to a nice satin sort of finish, nut knock that gloss down a bit? I recommend using masking tape and 0000 steel wool. Mask off the area you don't want to touch, and begin rubbing the steel wool in long strokes, using light and even pressure up and down the length of the neck. The 0000 is fairly gentle, so you don't really have to worry about taking off too much finish. Increase pressure as necessary until the desired finish is achieved. I have a feeling I'm gonna chicken out lol... I really love this guitar. The 0000 is definitely gentle. If you go that route, make sure to tape off the pickups too, and don't remove the tape until you have ALL of the tiny little steel shavings vacuumed up. People also have success with a Scotch Brite pad of some sort. I forget which one, but it'll avoid the pesky wool dust. It will look dull at first, but after you put some playing hours on it, the finish will take on a smooth, semi-gloss sheen. Just did this to my nitro-finished LP studio. I used the scotch brite pad thing (rather a kitchen sponge with the rough green side). Worked like a charm, was very easy and fast too. Don't know if it is as effective on acrylic finish, but that's where I would start. Mask off the rosewood fretboard all the way up and down (unless the sides are finished), and mask off each end too, liberally so you don't "overshoot". Make a nice shape at each end (look at the ZM or Michael Akesson sigs for inspiration). Then get to work. If you do go the steel wool route (if the scotch brite wasn't effective), do tape up the pickups. And I mean completely cover the covers and cavities, so there is no hole for steel wool fragments to get into them. The tape must stick to the wood all around. Wacuum after it's done, wipe down the body (taking care! Don't want to scratch the finish if there is any steel wool fragments left). Then, if you're paranoid like me, you put new masking tape on top of the masking tape already in place over the pickup cavities, which locks any leftovers in, so they don't get pulled off by magnetism when removing the whole deal. Tonight I was at the hardware store picking some stuff up and went ahead and grabbed some painters tape along with a green and Gray 3m pad. Taped up the pattern and started rubbing. Shoulda taken a shot first, I felt about sick lol. Turns out the green one that is labeled as replacing 0 steel wool gave me a nice satin finish where the Gray was too fine to do much. Wiped it down after and let it dry good and played around a bit. Amazing! Ended up doing the rest of the herd after lol. Definitely found the first mod every new guitar will get here. Cool! Can you snap a couple photos? This is really hard to capture in a photo. Pictures are great, and the difference is obvious! I am sure that neck feels absolutely amazing. Aesthetically, I think I would be forced to remove the tuners and take the sanding all the way up the back of the headstock and all the way to the body. I love what you've done, though. I can imagine how great it plays, now! The difference in playability is incredible. If you run your finger up the spine towards where it wasn't sanded the finger stops dead in it's track when you cross the line. I am considering taking it up the flares in the headstock for looks and maybe doing the sides of the neck up by the body yet. Looks great, I too can see the gloss knocked off. Someone should make a video doing this. I like how the neck feels on my Zach Myers with the gloss off of it and no finish. He he he, now that is funny. I do have a Porter Cable orbital sander I use to wax my vehicle with. well made!! very tempted to do his with my santana as I love how the ZM neck feels. can you show the 3M pad (not sure what that is) you´re talking about? I can't make this link work. Can you try again? Any long term repercussions of doing anything like this? It was one of my reasons for selling a couple of my PRS's (not the main reason). The two PRS that I have left are rosewood nex. One with the Awesomeness treatment and the other a PS... which may be the awesomeness treatment since they feel pretty similar. 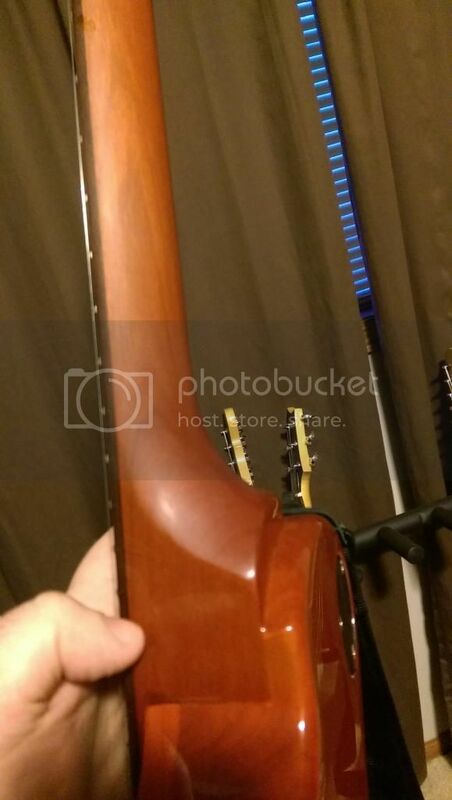 What is a rosewood neck with the awesomeness treatment? 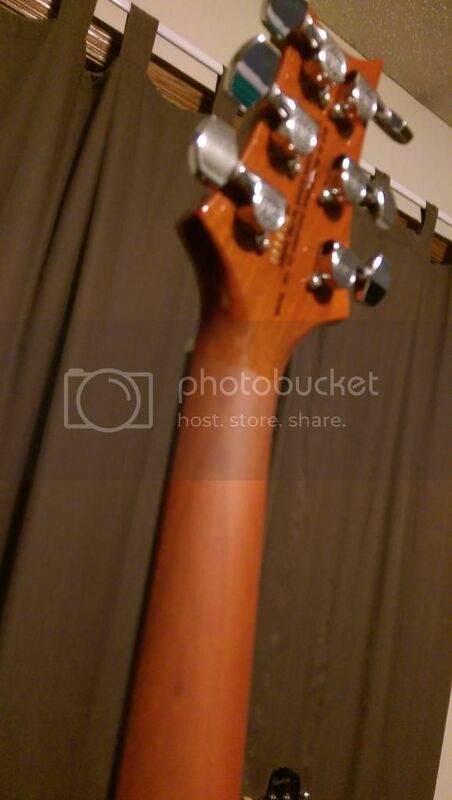 Aren't the rosewood necks already unfinished?? They look like the green scouring pads you'd use in the kitchen but they are different. They keep them with the sandpaper.